Push them together then POP them apart. 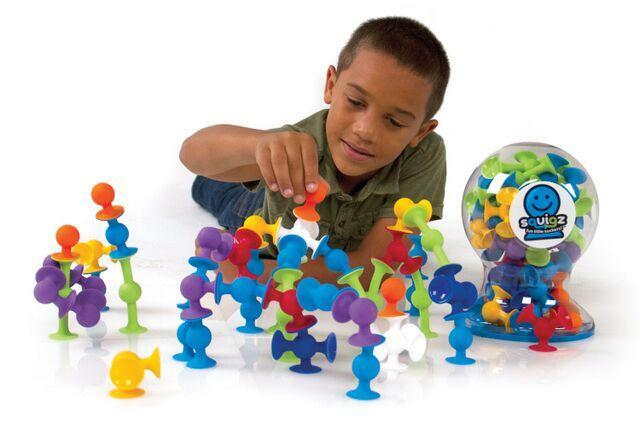 Squigz will stick to virtually any flat surface with no residue. Using "suction construction" and a little imagination, these fun little suckers will provide hours of creative play. They are flexible fellows and committed joiners. Squigz and fellow Squigz have one chief enterprise - creating things. Willingly, they assemble to become rockets, vehicles, a cushion for the cat, jewelry… they thrill in uniting as a ginormous octopus or squid. Ages 3 and up. Includes 50 pieces.